Just in time for this beautiful spring comes the Japanese Wisteria Festival, Fuji Matsuri. After all of the cherry blossoms have fallen from the Cherry Blossom Festival, Sakura Matsuri, this years spring is an exception, comes the blooming of the wisteria vine. If you haven't seen them yet just look around for the purple, pink, or white covered shrub/vine. They are a vine that you can slowly train to be a shrub. I saw the first one blooming two weeks ago on my twice a week journey to Longwood Gardens on Rt 322 just north of I 95 on the right hand side covering a tree. It was a few weeks early this year as with most other spring blooming plants. The general word at the Garden is that we are about three to four weeks early this year - nice weather, but are having a very dry season which if it keeps up could lead to a few problems later on in the growing season. Keep an eye on your gardens for dryness - put a thich layer of compost down - two inches a year is ideal, then add a layer of mulch to retain the moisture. I use both ground hardwood mulch and finely ground leaf mulch in different garden areas and at different times of the year. This is a very good sustainable practice to follow in your gardens. The idea is to keep all of your soil covered. A soil exposed to the sun quickly looses its very important biological contents - beneficial fungi, molds, nematodes, arthropods, etc., dries out, sterilizes, and allows "weeds" to take hold. I call this worn out soil - dirt. It won't allow much to grow in its depleted form and would require ammendments to bring it back to a healthy growing condition. 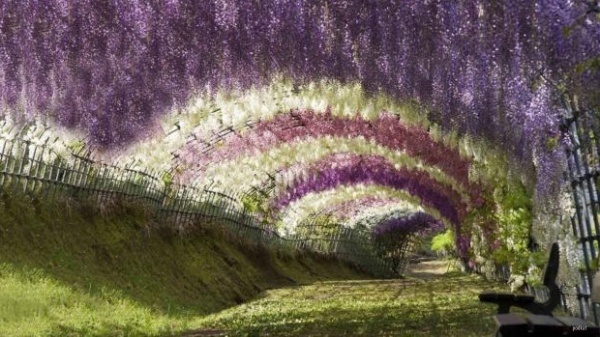 I came across a site today by "stomaster" of the Kawachi Fuji Garden in Japan with some spectacular photographs of wisteria tunnels. It's a bit slow loading due to the size of the photos but WELL worth the wait. Just imagine walking down the long tunnels with the smell of wisteria on a nice sunny day - mmmmmm. One of my suppliers has it growing all over his outside open office acting as a wall on one side and hanging down on two other sides - very nice.